Hay Caps were invented over ten years ago by Australian hay farmer, Phil Snowden. The concept of the Hay Cap was born as Phil, due to lack of covered storage space had to use tarpaulin to cover his valuable Oat and Lucerne hay. Aside from the safety issues, tarpaulin was time consuming to securely first fit and then re-fit when bales were removed. It would often stand water in low points causing it to eventually split and was unreliable in strong winds. 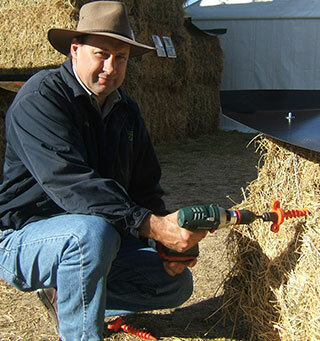 After achieving great success, the Award winning Hay & Straw cap is now sold across Australia and the USA with huge support from farmers and contractors. After several wet winters and faced with the prospect of building an expensive new Straw storage shed, David, whilst visiting farming friends in Australia was introduced to The Hay Cap. It was immediately apparent to David this impressive, simple, safe invention would be a success on the family farm in Yorkshire and to farmers across Europe. We are now the sole European distributors of this innovative new product.